When the IDrive for Mac product was released a a couple of months ago, users loved it for providing an alternative to very limited choices on the Mac platform. When we asked them on what they thought about the product, they suggested us that we need to have a drag-n-drop finder plugin to view, backup or restore in addition to the classic two pane scheduling application. 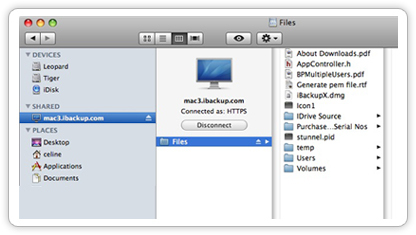 We listened, and hence the product, IDrive for Mac Finder Plugin. IDrive for Mac Finder Plug-in integrates with Mac OS X, making access to your IDrive account on Mac as easy as opening a Finder window. Just drag-n-drop the files/folders that you need to backup or restore. While IDrive for Mac application is optimized for best performance, for a quick look and easy drag-n-drop, the Finder Plug-in is a useful tool. Enjoy!